Ngorongoro Conservation Area (NCA) was established in 1959, most of it having previously belonged to the now contiguous Serengeti National Park. And, surprisingly, the Ngorongoro Crater is only one of many natural attractions that are contained within its vast boundaries (8,300 sq km). These include both dormant and active volcanoes, soaring mountains, archaeological treasures, rolling plains, rivers, forests, lakes and shifting sand dunes whilst almost half of the NCA is made up of vast tracts of open grassland, which swing in a vast arc stretching from the Serengeti in the northwest through the Gol Mountains to the Salei Plain in the northeast. Close to the centre of the NCA is Olduvai Gorge, the 'Cradle of Mankind', where the remains of our earliest ancestors, the hominids, were found. To the west lie the alkaline lakes of Ndutu and Masek, to the south Lake Eyasi and to the north the shimmering waters of alkaline Lake Natron. The Crater Highlands consist of an elevated range of volcanoes, craters and collapsed volcanoes (calderas) that rise from the side of The Great Rift Valley. Its peaks include Oldeani (3216m), Lemagurut (3107m), Olmoti (3100m), Loolmalasin (3648m), Empakaai (3262m) and the still active Oldoinyo Lengai (2878m), as well as the Ngorongoro Crater (2200m). As recently as 2.5 million years ago the young Ngorongoro Volcano became filled with molten rock that subsequently solidified into a crust or roof. As the lava chamber emptied, the solid dome collapsed and thus was formed the largest perfect caldera in the world (almost 20 km wide). Often referred to as 'the eighth wonder of the world' the Ngorongoro Crater is one of Africa's best-known wildlife arenas. A World Heritage Site, it is also one of the largest volcanic craters in the world (almost 20 km wide, 610-760m deep and covering a total area of 264 sq km). Explanations as to how it derived its name vary; some say it commemorates an especially valiant group of Datoga warriors who defeated their Maasai enemies in a pitched battle on the crater floor some 150 years ago whilst others believe it relates to a long-forgotten Maasai age-set. Most evocative is the suggestion that it refers to an old Maasai warrior, named Ngorongoro, who lived in the crater and made cowbells for his beloved herds of wandering cattle. An utterly unique biosphere, the Crater harbours grasslands, swamps, forests, saltpans, a fresh water lake and a glorious variety of birdlife, all enclosed within its towering walls. 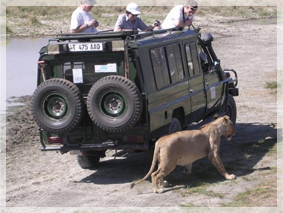 Due to its high concentration of wildlife, close-range viewing opportunities and striking scenery it is also Tanzania's most visited destination. Quite apart from the 'big five' (lion, elephant, rhino, leopard and buffalo), all of whom can often be spotted in a morning, the Crater also hosts up to 25,000 large mammals. Most are grazers, of which zebra and wildebeest comprise almost half, the rest being gazelle, buffalo, eland, hartebeest and warthog. As a result of these extraordinarily large numbers of herbivores, the crater also numbers one of the densest predator populations in Africa, most of which are lion and spotted hyena. Finally, the crater supports a large elephant population, most of which are bulls due to the relative paucity of food for the breeding herds, whilst certain animals such as giraffe, topi and impala, are notable by their absence.